“We’ve become leaders of [Conamaq] during difficult years … but here we stand. As long as we have energy, the struggle continues. We will not sell ourselves to any government or political party.” – Mama Nilda Rojas, Conamaq indigenous movement leader. 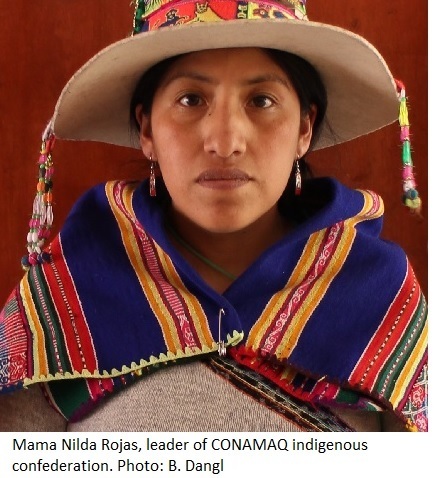 Translator’s note: Bolivia’s Conamaq indigenous movement is currently a major grassroots critic of the policies of the Evo Morales government and its Movement Toward Socialism (MAS) party. Because of this critical stance, the government helped to violently oust the Conamaq from their offices in La Paz this past December, and create a parallel, pro-MAS Conamaq. Mama Nilda Rojas is a leader of the dissident, or organic, Conamaq, and is interviewed here by Pablo Peralta M. of Bolivia’s Página Siete newspaper. While ex-Conamaq leader Rafael Quispe is seeking to run for president against Morales, the current Conamaq of Nilda Rojas rejects all political parties and alliances with any governments, and remains one of the few critical social movements outside the umbrella of the MAS party, along with a radical base of followers and a progressive vision for the country. In this interview, Rojas mentions the MAS-supported Mining Law, which gives members of the mining industry the right to use public water for its water-intensive and toxic operation, while disregarding the rights of rural and farming communities to that same water. 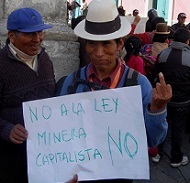 Furthermore, the law criminalizes protest against mining operations. 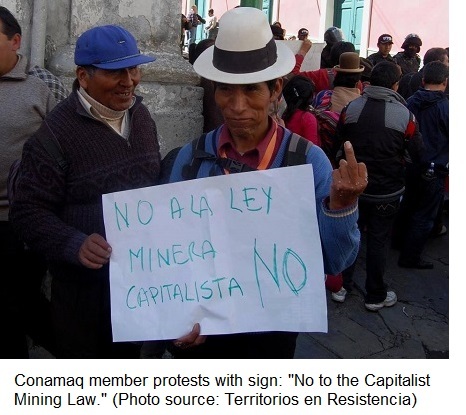 Conamaq’s struggle is part of a Latin America-wide grassroots push not just against extractivism, but also for respecting the rights of communities in the cross hairs of extractivism to prior consultation, an end to the criminalization of protest against extractive industries, and for a diversification of the economy beyond just the export of raw materials. The Conamaq stands beside many regional movements advocating the development of an economy and politics which respects the environment and indigenous rights while providing support and empowerment for a majority of the population. Pablo Peralta M.: There are two Conamaq organizations, and you say you represent the “organic” one. What is the state of the situation of the group that you lead? Nilda Rojas: The government has created a parallel organization because we don’t support their laws which are against Mother Earth and the Constitution. Now we are without government support, they have excluded us from the Fondo Indígena [which funds projects and functions of indigenous organizations], they have kicked us out of our Conamaq offices in Sopocachi [La Paz]. They also have not given us our legal power [as an organization], though we have completed the paperwork that the Ministry of Autonomies has asked us to complete. The ministry has instead given this legal power to Hilarión Mamani [the current leader of the pro-MAS Conamaq]. PP: Why is the faction that you are a part of critical of the government? NR: Conamaq decided, through its bases of support, to leave the Unity Pact [of social movements supporting the MAS] because we supported the 8th and 9th marches of the TIPNIS [mobilization against a government-proposed highway through indigenous territory]. Our crime was defending Mother Earth. Because of this the government of Evo Morales has told us that we are right wing, that we are financed by USAID, that we are conspiring against his government. But we know that this is all just talk, because as indigenous people we will always fight for our territory, something which is a mandate given to us by our ancestors. Without territory we cannot live, we are no one. Therefore, we will always defend Mother Earth. PP: Do you know when you might be able to buy new offices? How is that going? NR: I think the buying of offices will take a long time because of the high cost. We would only be able to afford rent costs. And we are also demanding [justice] in regards to the parallel Conamaq of Hilarión Mamani. Justice is slow, but we believe that it is moving forward because we have already made declarations regarding the undermining of our organization and the violence against us. So, we are patiently hoping that justice arrives. PP: How would you describe the relationship between social organizations and the government? 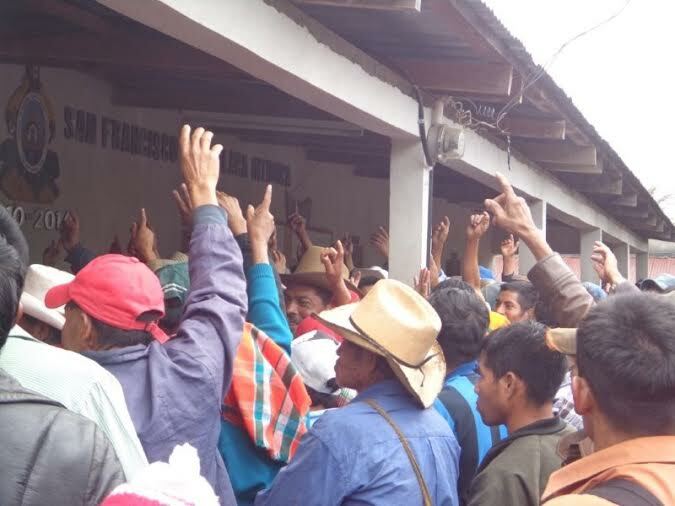 NR: As we know, the organic CIDOB [the Confederation of Indigenous Peoples of Bolivia], led by the brother Adolfo Chávez, also has its own parallel organization that the government has created, and which has generated this division. Unfortunately, the indigenous authorities of the CIDOB and the Conamaq see social organizations such as the CSUTCB [Unified Syndical Confederation of Rural Workers of Bolivia], the Bartolina Sisa [women campesina confederation], and other intercultural organizations, as truly asleep, because they don’t say anything, for example, against the Mining Law, the undermining [of social organizations like CIDOB and Conamaq], the Water Law, the Forest Law… and so many others. But above all, they say nothing about the Mining Law, which is a murderous and terrible law which puts human rights below the rights of miners. PP: Between redirecting and deepening the process, as some believe, what needs be done with the “Process of Change” [of the MAS]? PP: You are 28 years old. Is being young a challenge in front of the older indigenous authorities? NR: My age doesn’t do me any harm. But being an indigenous woman does, this has its limits. We live in a machista and patriarchal system, something which is also present in the social organizations. This government discriminates against me; it does not want to recognize our Conamaq, which is organic, and for this reason they created a parallel organization. But as a woman, I am fine, I have the support of my husband, of my children, and I continue fighting for them and for all of the [Conamaq grassroots] base, and all of my ayllus [community organizations], my authorities, which have entrusted me with this power, and I need to fulfill my mandate. Being a woman has its difficulties, but we’ll always break the chains of machismo. PP: How would you describe the role of women in social struggles? NR: The women are a key part of the struggle because we’re in all of the marches, in all of the mobilizations that we’ve had – despite the fact that we’re often unseen and not valued, but we’re there. We’re the ones who give sustenance to the struggle, whether it’s through cooking for marchers, or proposing ideas for dialogue, and figuring out where we can stay for night during marches and vigils. For more information see Conamaq’s website.